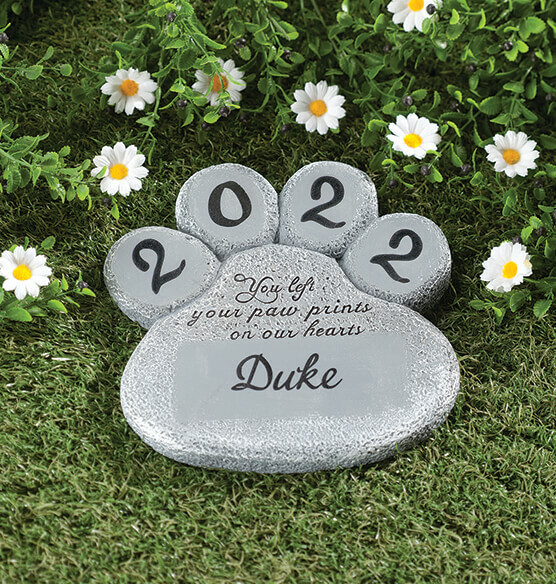 The spirit of your beloved pet lives on in the form of this beautiful personalized pet memorial stone. Shaped like a large paw print, this stone is crafted of 100% cement, making it durable for outdoor display. The lovely inscription reads, "You left your paw print on our hearts." 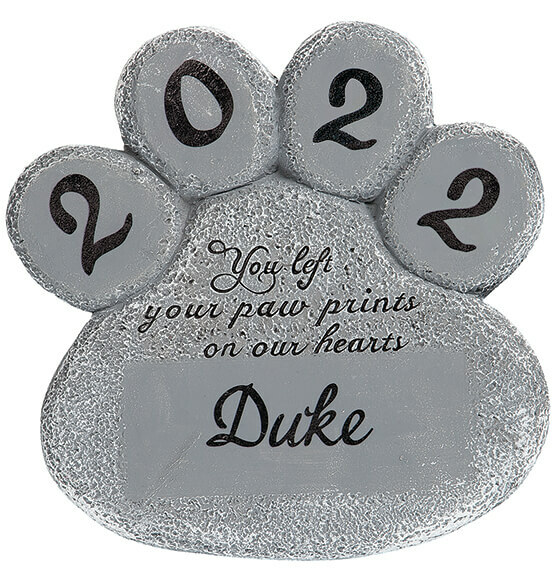 Personalize it with your pet's name and a date of your choice. Name limit of 1 line with a total of 9 letters/spaces. Date limit of 4 characters. Stone measures 8-1/2" long x 8" wide. Bring inside during cold, snowy months. I used this as a grave marker It looks the way I wanted it to and so far has held up well. I assumed the numbers and name would be engraved but only the phrase is. The year and name are painted on, but looks nice My only concern is how well/long the paint will last. A great gift for a friend who lost her long time pet. Because our friend loves to spend time in her garden and spent time there with her pet, this is a very nice memorial that will remind her of these times. It is alright. I liked it. I bought this product because my dog died recently so I wanted to decorate the place where I buried him. Now it looks better and more special. Now it isn´t just a garden, it is a special place for him. When I got the product it looked a little different from the picture. The color was supposed to be blue but it looked more gray, like it was fading the blue color. Some of the letters are hard to read, like the color was fading too. Purchased this as a gift for some friends who recently lost their dog. It had great reviews, shipped fast and the price is unbeatable. I am very disappointed with how it looks. In the picture online it doesn't show you that there is a "box or background" around the pets name and numbers. Please see my picture vs. the picture online. Very disappointed. If I would have known it was going to look like this, I would not have purchased it. I purchased this to place where we buried my chihuahua, and after a year it has completely disintegrated. I wish you had the square green ones that you have been selling for decades. The names and dates were etched into the stone. This one has the name painted on and I'm sure in time it will fade. Ordered 2, they were beautiful, we had a cold spell and went to look at them and were all crumbly, was so disappointed. I loved this. I received it in September after my dog of 14 years passed and broke my heart. It was the perfect legacy for her. Then. I went outside last week and found it DISINTIGRSTED. it's practically dust!!! I would not buy this product. This product was a piece of junk. It broke up and cracked before the first year was up. I would expect if you sell a garden stone it could be put outside. Very disappointed and a waste of money. It didn't even last 4 months! We are very dissappointed that we spent money on this. You can see in the pictures how it just desintegrate! Do not buy this product!!! It is obviously not made of 100% cement like it says in the product description! I wish I can get my money back because this seller is a totally liar! Disintegrated after only a couple of months! The product came as it looks in the picture, and it did look nice initially. However, it is very poorly made -- I could tell that from the start. It disintegrated after only three months of being in our yard. It feels incredibly disrespectful to us and our dog. 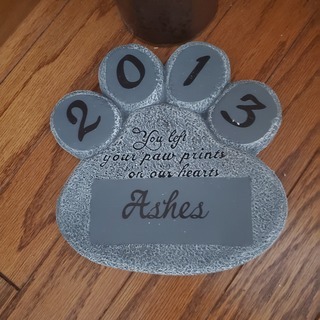 My parents and I purchased two of these stones for our dogs who have passed. After just a few months both stones are totally disintegrated. One day I went to check my dogs grave and there was nothing left of his stone but rubble. (There had not been any bad storms or anything that would destroy it and the site is protected so it wasn't someone doing it) The other stone was the same way. We were very disappointed in these stones, as they look beautiful and seemed like the perfect tribute to our babies. This is advertised as a concrete "Memorial garden stone." Concrete, right? Lasts a very long time outdoors ("garden stone"), right? WRONG - not this one. Looks like a birthday cake left out in the sun. Totally unreadable. Disintegrated (as others have apparently said). Only now do I read the last (new???) line of the description: "Store inside during cold winter weather." Right, who's going to do that? If you are willing to keep this inside year-round, you will enjoy it, but forget leaving it outside. Bottom line: 4-stars for inside use, 1-star for outside. I bought one of these last August, now six or seven months later, it has completely deteriorated. You cannot even read the name anymore, it's all CRUMBLED! It fell apart. I have one I bought from another store, different style but it has held up now for 4 years. Would now buy this one again. Also saw a comment where not to leave outside in the winter which I did but really who remembers to bring them, Why have something you can use all year around. Very disappointed will have to try and find another one for my daughter's dog. I bought three for all my dogs graves and they have not lasted al all. Everyone of them have crumbled. Product not worth it nor the price i paid. I am very disappointed in this product. I love my pets as my children and now I am having to look else where for a marker. They are beautiful and mean so much. I have received one and I love it. My father lost his dog suddenly. He lives on a fixed income and wants to mark her grave. Sweet message, includes my dog’s name and able to sit outside upon her grave. Very nice paw print and message. Awaiting its arrival. My Yorkie passed away recently and I loved this memorial stone. Good value for what I wanted. Can be kept outside year-round. My best friend from out of state had this stone sent to us when our beloved dog died. We love it. Though it is made for a garden, it is comforting having this marker near the spot where she laid next to our fireplace and matches our stone. Now, our mother lost her dog and we think she she will feel comforted by this memorial marker, too. Recently lost our dog and wanted a memorial stone. Because my dog passed away. My brother and sister-in-law’s dog passed away. I’ve ordered one before and loved it. Our dog just passed away. BEST ANSWER: Thank you for your question. It is 100% cement. We hope this information will be of help to you.